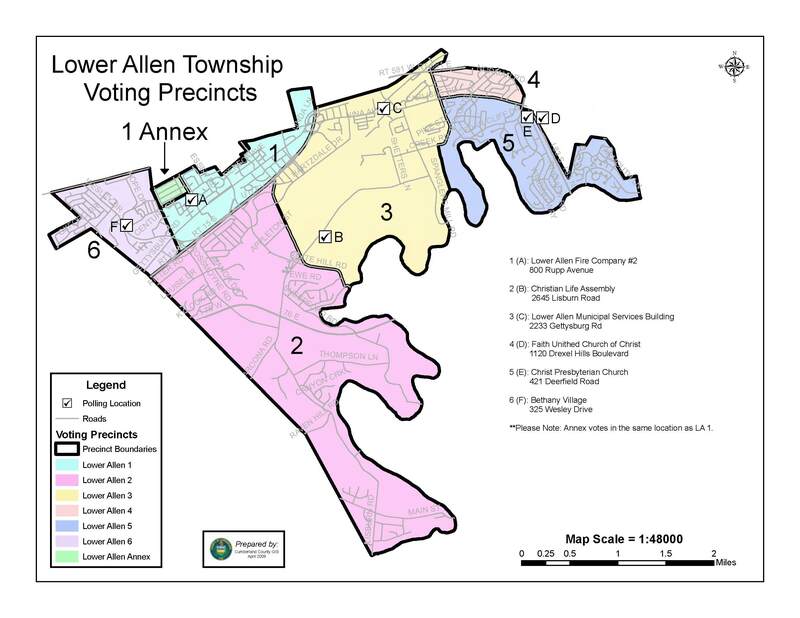 Thank you for your interest in employment with Lower Allen Township. Lower Allen Township is seeking to hire full-time and part-time Paramedics. Please see the job description and photo below for additional requirements. Application (Click Here) and job descriptions (Click Here) are available here or may be picked up 2233 Gettysburg Road, Camp Hill. Applications for full-time positions must be submitted to the Human Resources Department by April 30, 2019. Applications for part-time will be accepted until all positions are filled. Lower Allen Township is seeking to fill a Temporary Laborer position to work at the Township building. Minimum 18 years of age and must possess a valid PA Driver’s License. Work is mostly performed outdoors and primarily consists of landscape work but may include some indoor maintenance work. This position will be available mid-May through August with a work schedule of Monday – Friday, 7 am – 3 pm. Applications (Click Here) are available on the Township’s website at: www.latwp.org or may be picked up at 2233 Gettysburg Road, Camp Hill. Applications must be submitted to the Human Resources Department by April 26, 2019. Lower Allen Township is seeking to fill a full-time Maintenance Specialist position. Duties include work within the Public Works Department. Must be a minimum of 18 years of age, possess a valid PA CDL Class “A” license or the ability to obtain within 6 months of hire and be able to work outdoors in all types of weather conditions. Snow plow experience a plus. This position offers a full benefit package. Application (Click Here) and job descriptions (Click Here) are available here or may be picked up 2233 Gettysburg Road, Camp Hill. Applications must be submitted to the Human Resources Department by April 19, 2019. 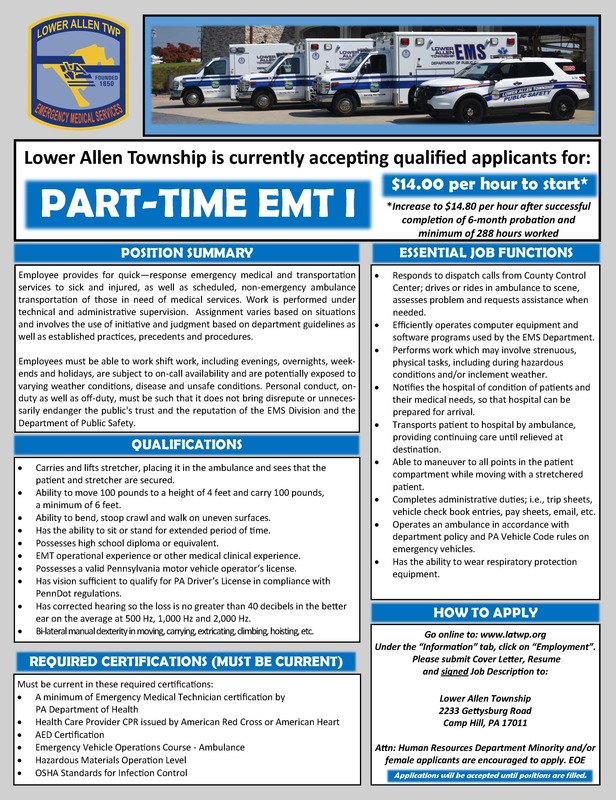 Lower Allen Township is currently seeking to fill part-time positions in the EMS Department. Minimum 18 years of age and EMT certification by the Pennsylvania Department of Health. Other required certifications and qualifications are listed in the job description. Click Here for the Application. Click Here for the Job Description. 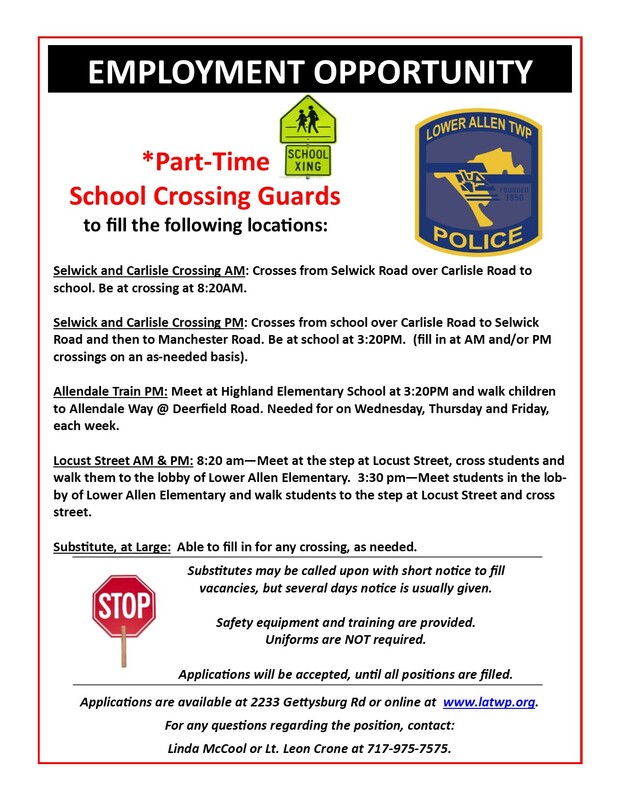 Lower Allen Township Police Department is seeking Part-Time School Crossing Guards. Positions will be filled for the 2018-2019 school year. Additional positions may become available throughout the school year. Applications will be accepted until positions are filled. Substitute positions may also be available throughout the year.